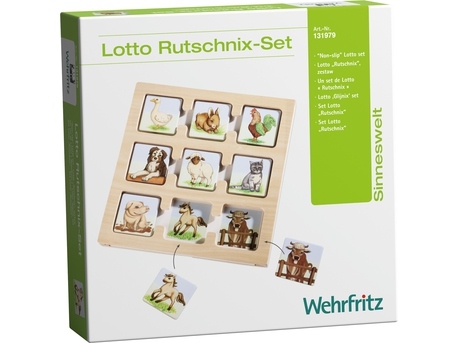 Child-friendly designs featuring jobs, farmyard and forest animals encourage: play. Simply slide a game template into the frame and place the appropriate cards on top of the acrylic sheet. Contents: 3 boards and 27 cards (6 x 6 cm) made from sturdy card and 1 frame made from birch ply- wood and acrylic (26.5 x 26.5 cm). 3 boards and 27 cards (6 x 6 cm) made from sturdy card and 1 frame made from birch plywood and acrylic (26.5 x 26.5 cm).